Bwin Poker is one of the few elite poker rooms that offers software compatible with both Windows and Mac OS. But you don’t have to necessarily download the software to get in on the poker action either. They offer an in browser version that you can play instantly. While this is ideal for poker on the go, it also means that Linux users aren’t excluded either. At this time, bwin does not accept U.S. players. Once you complete the simple registration page, you will be taken to bwin’s homepage where you can either download the full version or play instantly in your browser. Although you aren’t required to download the software to play at bwin, doing so will provide you with extra features including statistics, the ability to write player notes, real time odds, the option to have mini tables, hand history replayer, preferred seating, and more. 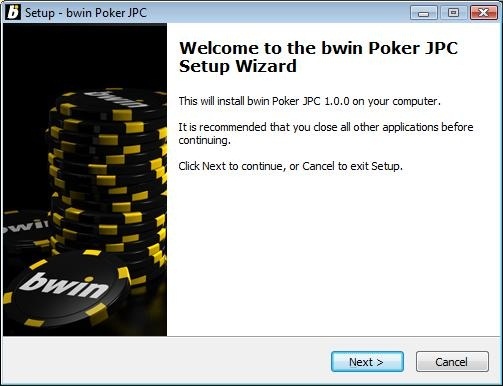 After saving the .exe file to your computer, you simply need to double click on the file and you will be taken to the bwin Poker Setup Wizard. Accept the agreement, click all of the next buttons until you get to the last page where you click install and voila you will be ready to play at bwin poker. The download file isn’t very large at all, so downloading the software should be superfast for everyone. To create international appeal, Bwin offers the program in 22 different languages: English, German, Spanish, Italian, Swedish, Greek, Polish, French, Danish, Norwegian, Turkish, Catalán, Czech, Hungarian, Dutch, Portuguese, Russian, Slovak, Slovenian, Croatian, Romanian and Bulgarian. Your language of choice can be chosen during the download setup. This is especially important since a large percentage of the player base will be from Europe. Bwin Poker is safe and secure, fully licensed by the Government of Gibraltar, and independently regulated by the Gibraltar Gambling Commissioner. And of course, playing at bwin means you won’t miss out on any of their great promotions.